It’s such an honour when a bride selects you as the maker of… well, anything intended for her wedding day, because you will be contributing to one of the most memorable days in a persons life, something they may have been dreaming of since childhood, and you have a chance to help them create a truly personal and meaningful occasion. This is one of the great joys of the job, and every year we take on a select number of bridal corset commissions to help weave that web of poise and elegance, and more often than not, it all starts with the underwear. Many of our brides have already lost their heart to an exquisite gown by the time we meet, and their needs are for a garment that will offer some light figure shaping and control with good bust support so that they can avoid the straps of a bra showing. The most popular style for this set of needs is one of our cupped corsets, which offers a more natural, rounded bust shape than the more traditional princess seamed overbust and is a really comfortable style for long periods of wear. The cups are drafted especially for each clients bust, and the lower half of the corset will be made using the panel style that best suits the individuals figure and needs for the day. This allows us to be really responsive to the requirements of the client and to create a bridal corset that is flattering and supportive in all the right ways, and can even be the starting point of a love of corsets for newcomers! Timescale is the main limiting factor in pieces like this- a cupped overbust is our most involved style where individual engineering is concerned, and we advise clients to expect three toile fittings at our studio in addition to the initial consultation and measurement taking. At present we only offer this style with in-house fittings, so as to provide the very best service possible. Naturally, the times involved are dependent on how flexible the bride is in attending fittings, but on average we ask brides to plan for beginning the process in earnest at least 3 months prior to the date the corset is required. You would be surprised how quickly that time goes! This brings us to the main issue we see with bridal underwear commissions- all too often we only hear from our client 6 weeks before her dressmaker needs to see her in all her underwear for the initial fitting or alterations. For many of us, a wedding dress will be the first garment we’ve ever had made from scratch, or had to order 6 months ahead, and it comes as a shock that everything needs to be set in place so early for the process to run smoothly. Shoes and underwear affect the fit of a garment so much more than most of us will realise at the early stages of planning a wedding, and when you bring a corset into the equation the entire fit of the dress is being challenged as proportions are redistributed and your posture is straightened and held snugly in place. There is a lot more for the dressmaker to do than simply make the gown at the reduced waist size, so your underwear should be considered at the same time as the style of dress you intend to commission or buy. It’s become increasingly popular to wear separates instead of a traditional bridal gown, and a corset and skirt combination can be a really great approach to this contemporary bridal styling. A bridal corset is a perfect base for delicate, detailed embellishment of many different types, including trailing organically styled lace appliques, several gently toning shades of silk to highlight the silhouette and create a more architectural aesthetic, or even twinkling clusters of crystal emerging from the hip-line or descending from the bust. Our clients almost always request overbust corsets for this style of outfit (though underbusts or waspies can be used to great effect with Grecian style gowns, or draped sari’s) and the most popular style is our princess seamed overbust which is considered the more classic overbust design, with cuirass style paneling and romantic sweeping lines that lengthen the torso. Fuller busted clients can still opt for the cupped overbust for support and a more personalised approach to the shaping, and either style can be made to give more coverage around the chest and shoulders with a draped halter-neck, or tailored strap. These pieces usually require a collaboration between the designer of the skirt and ourselves, often including fine details such as purchasing the silks from the same roll so as to avoid any colour variations where a perfect match is required. 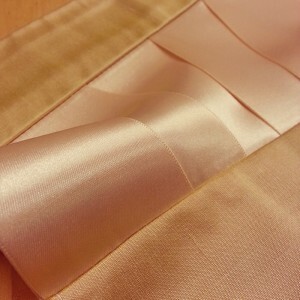 Again, dates will be crucial, and may be led by whether the skirt maker requires the corset completed for any stage of their fitting or construction process, toiles will still be required for the princess seamed overbust, and a minimum of 3 months should be allowed from first consultation to the required date of completion. These corsets tend to be more demanding from the design and embellishment side, and clear concepts of your wedding theme or desired aesthetics for the bridal outfit will help us to make the corset an integral part, or even a centre-piece of your celebrations. Our experience with brides over the years has taught us that most women aim to begin a new diet or exercise program leading up to the wedding day, and whilst we understand the drive for a healthy start to your new married life, it is important to consider your goals as early on as you possibly can. For a corset being created especially for a single event, we cannot work with measurements that are expected to change dramatically. It’s often assumed that because corsets lace up, there is adjustment in the piece, and that it can accommodate you at a smaller size. Whilst this is true, and allowances can be made for more every-day items, the fitting process for a bespoke item of this nature relies on stable body sizes, most particularly for cupped overbust corsets, as the cup shape is drafted to your individual size, and weight loss will inevitably affect your bust-line or volume. 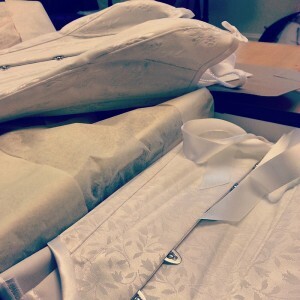 Put simply, a corset primarily made for one special day has to be measured and cut to one size. If we allow for weight loss that is not achieved in time, or if the weight loss affects the figure in a different way than predicted, the corset will simply not fit well, and our main goal is to provide you with a beautiful garment that exceeds your needs in every respect. With this in mind, an ideal situation would run as follows. Let us say that it is August 2014 when you decide on a 1st September 2015 wedding. You already know that you would like a gown by a certain designer, and they have informed you that it will be a 6 month lead time, and you will need your shoes and underwear ready for fittings and alterations 6 weeks before the wedding. This means that you require your corset from us by mid July at the very latest, and with us requiring a minimum of 3 months from first consultation and measurement taking to delivering your finished corset, we would need to meet you in person around mid April, if not earlier. Let us say that you would like to lose half a stone for the wedding day. Allowing a month for you to monitor your new stable weight, you would need to have reached your goal-weight by mid March so that when we meet you for your first consultation, every measurement we take can be relied upon as a fair representation of your size. We still encourage new brides to contact us well ahead of time to make appointments, discuss ideas, and just so that we know to expect you! In particular, our summer bridal demands can be intense, and as there are limited spaces available the earlier we know about your plans, the more options we can make available to you. An example might be ordering in designer lace from overseas, or sourcing a difficult colour match in your desired fabrics. Even if you fear you are too late for the corset you had originally envisaged, don’t be afraid to give us a call to discuss your needs- we may have an alternative suggestion for you to help you create your desired ensemble, or we may be able to work around your deadlines. Either way, you will find a friendly reception and a creative mind to share ideas with as you dream of your special day. We’ll look forward to hearing from you.